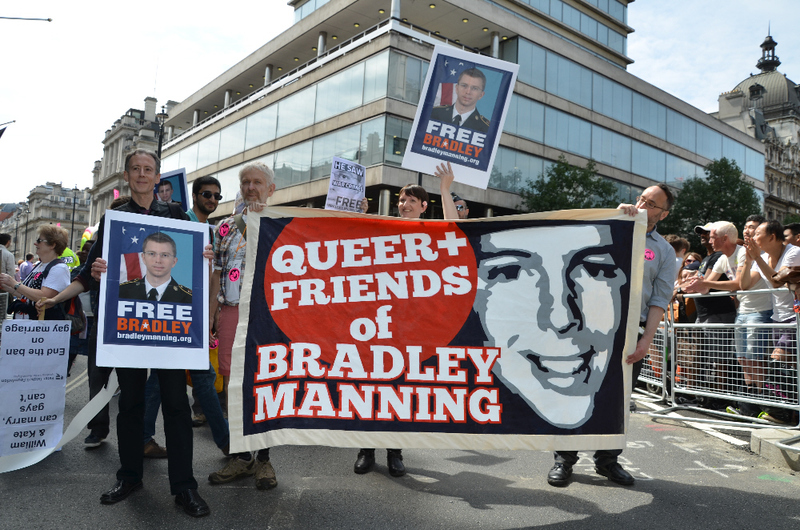 There was a sizeable number of Bradley Manning supporters at the London Pride Parade on Saturday 29 June thanks to the efforts of Queer+ Friends of Bradley Manning who co-ordinated the Brad contingent as well as creating a beautiful hand painted banner for the occasion, using a design by Somerset Bean. Follow this link for more photos and banner-making instructions. This was our biggest London Pride yet! 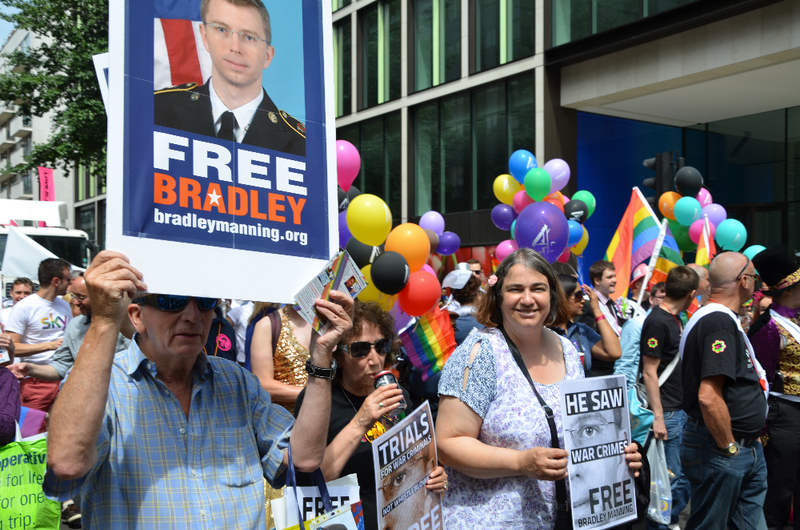 A huge thanks to all those who came and joined us in supporting Bradley Manning, we had a great day and handed out 4,000 flyers and 1,000 stickers to really supportive crowds. We were spotting Bradley Manning stickers on people the entire day. 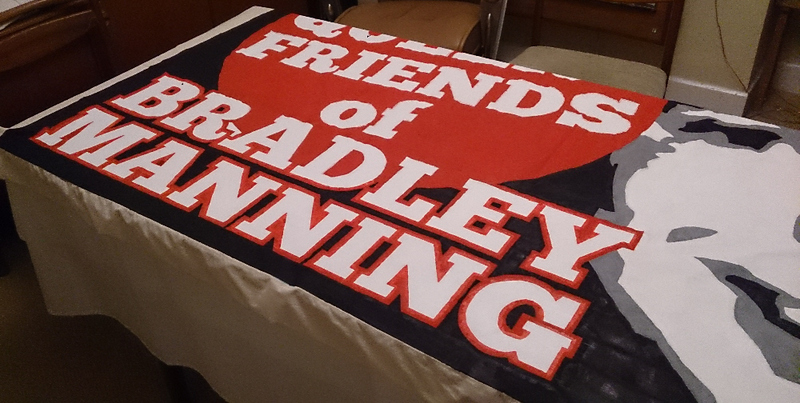 We were also really pleased to debut our new Bradley Manning banner which had kindly been designed by @SomersetBean – a mother of one of our group hemmed the banner while two others hand-painted the banner over the course of several days, finishing at 1am on the morning of Pride itself! Sadly, despite our best efforts, we were unable to livestream on the day, we just couldn’t get a connection to the livestream servers and we had to ditch that plan – even sending tweets with images attached proved impossible. Those problems aside, we had a great turnout with many people promising to join us next year. All in all, a fantastic success! 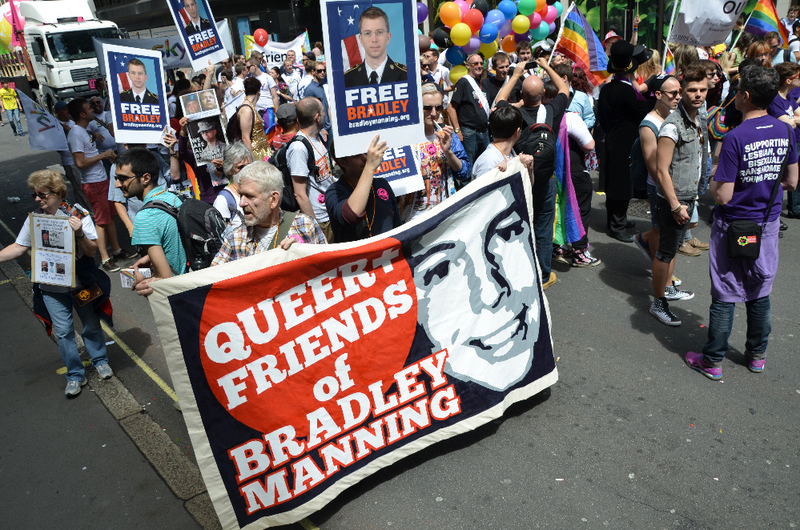 Meanwhile, in San Fransisco, where the Pride Board had named Bradley Manning Grand Marshall and then quickly changed their minds leading to weeks of protest, Brad featured prominently in Sunday’s Parade regardless, as the ‘People’s Grand Marshall’ represented by Pentagon Papers whistleblower Daniel Ellsberg and with over 1,000 supporters joining the Brad contingent. Thanks to Q+FBM for photos. See more here. 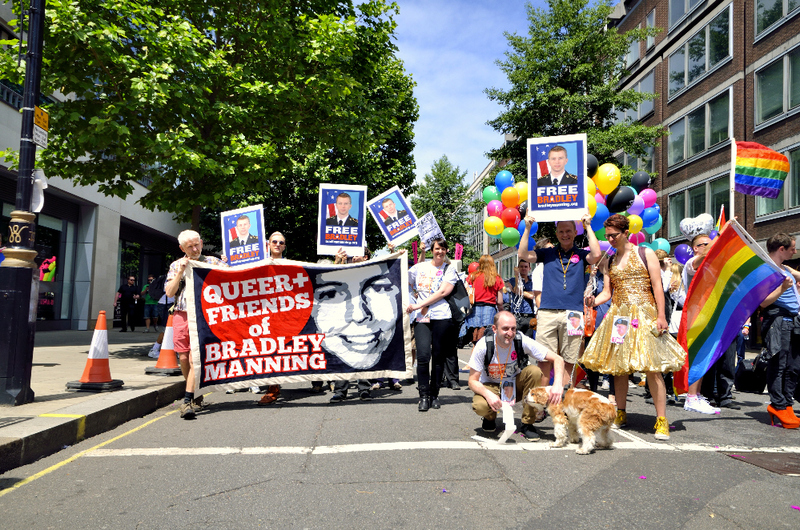 Gallery | This entry was posted in Manning, Reports and tagged Bradley Manning, leafleting, London, parade, Pride, Queer Friends of Bradley Manning, solidarity, stickers. Bookmark the permalink. This is awesome. I’m glad that people support Bradley Manning. I’m glad that we can show people that this young soldier didn’t deserve to be tortured by his own government, and definitely doesn’t deserve to be thrown in prison for the rest of his life. I don’t think that this is really just a single issue cause. . .this is a human cause and it is wrong on so many levels how he is being persecuted. Not just him but everybody who attempts to bring transparency to our government. We need more people like him. Courage is contagious, as Glenn Greenwald said when discussing Edward Snowden. We need to stand up and be counted..